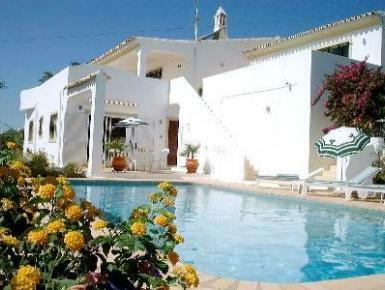 A perfect villa for your Algarve rental vacation. The villa is situated in the hillside town of Sao Faustino,Loule - Central Algarve. The large 10m x 5m pool is perfect to relax by. Beautiful scenic gardens, shaded terraces and barbecue areas offer an ideal space for quiet relaxation and al fresco dining. Quietly positioned, yet close to the activities of nearby beaches, resorts and golf clubs. South facing with superb panoramic views to the sea, this is your perfect spot. The answer to your Algarve villa rental needs. Patio doors from the lounge leads to a large covered terrace. This barbecue terrace commands stunning panoramic views of the coast stretching for miles beneath you. What better place to sit watching the sun setting while sipping a cool drink or two. The above average size pool is set below the terrace and is the perfect place to unwind.